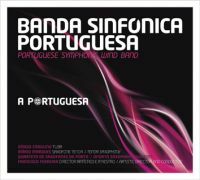 A Portuguesa CD recording by Banda Sinfonica Portuguesa conducted by Francisco Ferreira and featuring Sérgio Carolino-tuba, Mário Marques-tenor and alto saxophone, and the Oporto Saxophone Quartet. 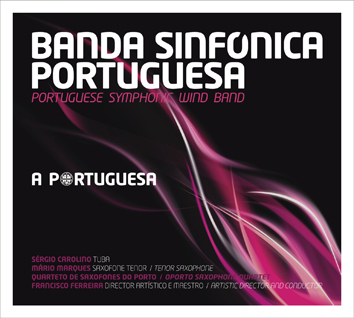 Banda Sinfonica Portuguesa is an award winning wind band from Portugal that consists of 70 talented young musicians who have attended some of the most prestigious music schools in Portugal and abroad. 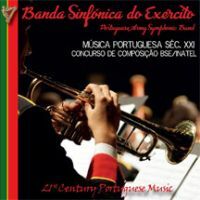 Their newest CD release, A Portuguesa, highlights an array of music from Portuguese composers, including three pieces that feature tuba virtuoso Sérgio Carolino. All three pieces were written in collaboration with the soloist, and the style of each piece reflects the musical background and tastes of Carolino. The first piece on the recording, Guide to the Glory (2009) by Telmo Marques, is a short fanfare with solo tuba. The piece opens with a driving trumpet ostinato that leads into an opening solo that is written in a funk style. There is a more lyrical middle section with a quasi cadenza that leads into another section of driving music that continues until the end of the piece. The entire piece takes influences from jazz and funk. Concerto for Tuba Op. 139 (2006) by Jorge Salgueiro was commissioned, dedicated, and premiered by Sérgio Carolino. The liner notes of the CD even indicate that, “the author was influenced not only by the musical tastes but also by the personality of the interpreter.” This concerto consists of five movements that are through composed. The piece utilizes extended techniques such as buzzing, multiphonics, and lip beats in both the solo part and the ensemble. The musical language of the piece tends to be tonal and again has jazz influences. This concerto is a major virtuosic piece and will take a very strong tubist to be able to perform the work, which Sergio does effortlessly. The final piece on the CD that features tuba is the Double Concertino for Tenor Saxophone, Tuba, and Concert Band (2008) by Luis Cardoso. This piece is in three movements with the first two movements through composed and a short pause before the start of the third movement. Just like the tuba concerto, this piece is highly virtuosic and the outer movements are full of energy. The middle movement is slower but still has a lot of power in the music. The performance quality of this recording is just incredible. The soloists and the ensemble show a level of musicianship that is top notch. This recording is a great example of the virtuosity and musical personality of Sérgio Carolino. I would highly recommend purchasing this CD. !